It wasn’t easy, but I forced myself into workout gear. I hadn’t been doing it for very long, so it was a slow pace. I kept at it, believing that some day, I’d get better. All of a sudden, I heard laughter. Menacing laughter and then a water bottle was thrown at me. I stopped in my tracks, confused as to why someone would do such a thing. Some time later, I’m still battling the same struggles with my weight and body image. This time, I’m determined to make things stick. I adopt a new regiment and lifestyle. I go to the gym regularly, and believe that things will change with time. One evening, the gym was empty. I was the only person in a row of treadmills. As I jogged, I noticed two young men making their way towards me. They took the machines to my right and left side and began to jog. Then, they decided to talk over me loudly. They acted as if I wasn’t there, having a loud, full blown conversation without any regard of how it may have impacted me. A couple years later from that incident, I was in a boxing class. I had been doing it for a some time now, and I had made great progress. I opted out of the regular fitness bag training for in ring experience and technique. I decided to take two classes – this one was a beginner class, and would serve as a warm up for the second advanced class. The instructor understood this, and had intention pairing me up with first timers. I looked over at the girls. They lookedi at me and giggled, commenting on how neither one of them wanted me to be their partner. They made judgments based on my appearance, and believed that I was not capable of handling the workout. It is that time of year when people think about their health and physical fitness. They make resolutions and investments in meal plans and gym members. For many people, they are starting from square one. Being in that place is hard. You want to make the change, but it can be painful and trying. You want to try, but sometimes, it feels like it’s not working. In these challenging moments, you need all the support you can get. You don’t want or need to hear anything that would derail you. The situations I mentioned happen to people in some form. It’s exactly why some are hesitant to put effort. The beginning stages are hard enough without the judgement. When those things happened to me, I could have turned around and quit. I could have let those people take charge of my own goals. Instead, I turned a blind eye and a deaf ear. They are white noise. I can’t let them dictate what I do. If you’re with me and starting over, I applaud you. It’s not easy. There will be challenges and there will be those who aren’t supportive. It’s easy to react, and it’s hard to ignore. I hope that you remember that your goals are your own. You chose them and you have all the strength in you to achieve them. Never let someone steal that from you. Never let someone have that much power over you. They are white noise. There will also be moments where it feels like nothing is working. Take a step back and reevaluate. Can you make changes? Can someone give you some advice? Don’t give up – everyday of work is a step closer to your goal! 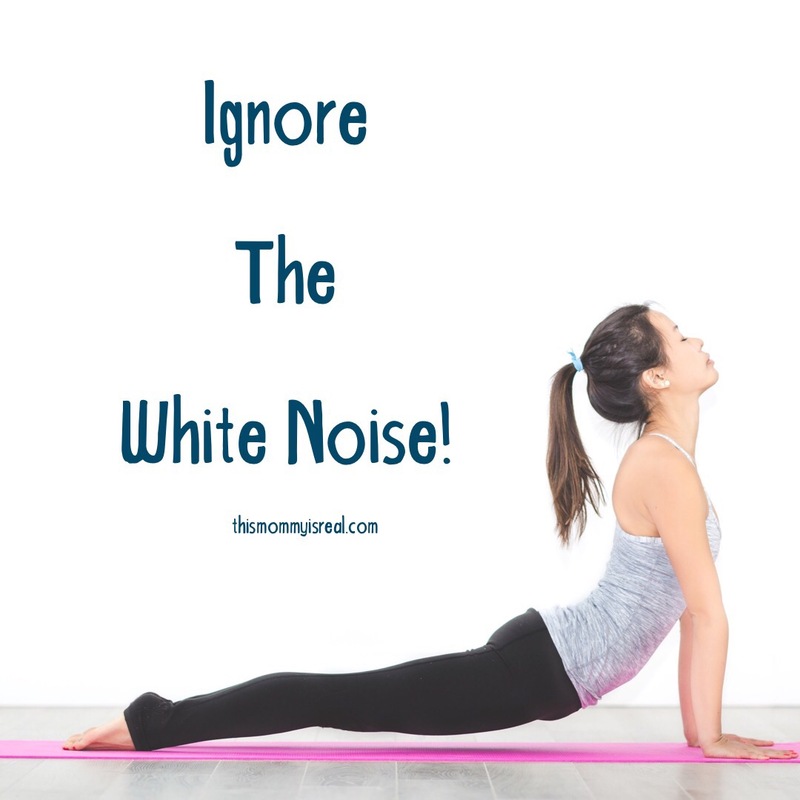 No white noise – not now, not ever ! Such a motivating post! Keep putting those gym clothes on, you got this! Yes, I’ve been doing well so far! It’s crazy how clueless/inconsiderate other adults can be! I’m with you- Ignore the chatter/white noise and do what you need to do. Today is my first rest day from the gym in 2 weeks, and I can’t wait to go back tomorrow! It takes two weeks to form a new habit- You’ll get There! I scheduled my workout time in my iCal as busy time! An post too practical. I also have the same condition as you when the first few days into the gym, and then I have to rest for a very long time. It definitely gets better with time! I need to find your motivation and get my workout clothes on. Not feeling well this week but hoping to get back on track next week! With that said I say keep on trucking, people can be real Jerks. Don’t let anyone else or there disgusting behavior get you off track, you are awesome! It’s hard to get started, but once you’re there, it’s awesome! Working hard and being consistent is half the battle. I hope you don’t get discourage and reach your goal. Thanks for sharing. It’s so hard. In your head you know that those people were rude. In your head you know those people were wrong. It can sometimes be hard for your heart to reconcile with what your head already knows. Just know that they were small minded, and don’t deserve a second thought. You continue to do the best you can! You will kill it this year! Thank you for your kind words! I will definitely do my best ! I can not believe the audacity of people. I’m so thankful that I found a gym that is encouraging and welcoming and accepting of any and all fitness levels. Not just the coaches but the other (mostly) women that attend the gym. I hope you find that community but good for you for blocking that all out and keeping on your fitness journey. I just told my husband, literally five minutes ago, that we need to start working out again! I refuse to get a membership to a gym because I feel as though people are judging me all the time (I’m a beginner I’ve picked up doing it and then stopped quite a few times). Luckily where I am living now has a gym that is paid for with my rent so I have access to it. This year I WILL be using it just so I don’t have to feel judged and maybe it’ll stick. Wow! I cannot believe that people would behave that way. I’m so sorry that some of your experiences have been so negative but I’m happy that you have been able to walk away and see the bigger picture. I’m seriously just in awe that people would be so rude. I hope that you continue to enjoy your workout journey and thank you for speaking out!